LollyZip® is a Registered Trademark. What is 3-1-1 TSA Compliant? The Transportation Security Administration (TSA) operates the security check points at airports. 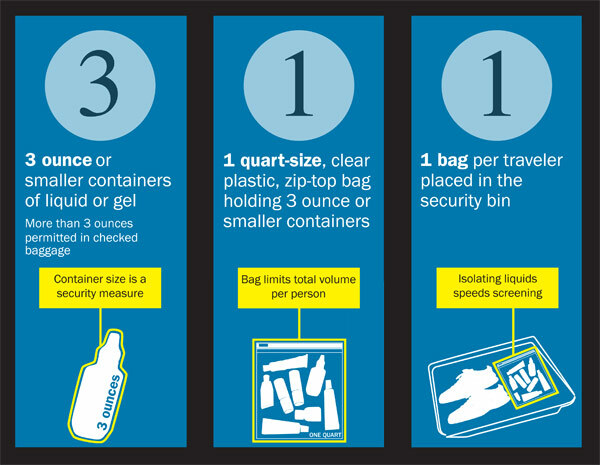 When processing through a screening checkpoint, each traveler is allowed one bag in order to limit the total volume of liquids, aerosols and gels. Consolidating products into one bag and X-raying them separately from the carry-on bag enables security officers to quickly clear all items. 3-1-1 for carry-ons = 3.4 ounce (100ml) bottle or less (by volume); 1 quart-sized, clear, plastic, zip-top bag; 1 bag per passenger placed in screening bin. One-quart bag per person limits the total liquid volume each traveler can bring. 3.4 ounce (100ml) container size is a security measure. Please note, a traveler may place as many bottles and containers as you can fit in a quart-sized bag as long as each individual container is 3.4 ounces or less. LollyZip is 3-1-1 TSA Compliant! What makes LollyZip silicone squeeze bottles special? LollyZip silicone squeeze bottles have a unique, smart shape. Unlike Go Toobs® which have "shoulders" at the top of the bottle which catches the product making it impossible to dispense, LollyZip has a sleek design with no shoulders so that your shampoo, rinse, whatever will not get hung up and will easily dispense! LollyZip's tapered design allows for optimum packing into the quart-size bag so you can pack more bottles and jars into the bag with no wasted space! What are the bottles made of? LollyZip squeeze bottles are made of food grade silicone FDA approved. While the bottles are intended for personal care products, you can be rest assured that whatever you put in your LollyZip bottle will be safe. The large spray bottle comes out in a stream instead of a spray. Both the large spray bottle and the perfume/cologne spray bottles are designed to spray a fine mist. 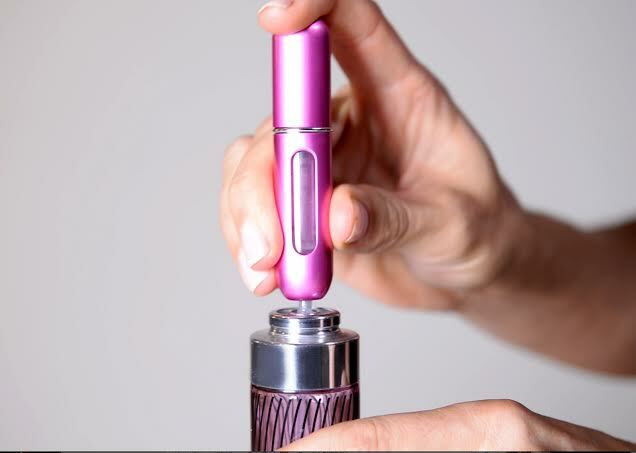 If a bottle is dispensing a stream, run warm water over the nosal to dilute or dislodge any product that may have dried on the tip. Also run warm water over the cap area where it screws into the base if the cap seems stuck, this will dilute any product that may have dried into the threads. I can't get the spray cap off the perfume/cologne bottle. How do I fill the silicone bottles? How do I clean my LollyZip products? LollyZip silicone bottles, lids, jars and lids are dishwasher safe on the top rack. Handwash the spray bottle and quart-size bag. What is the GirlyGoGarter® and how does it work? The GirlyGoGarter® is designed to fit sizes 0-18. Our sizing is based on USA standard ladies' pants sizes. So, if you wear a size 10 in slacks, you would wear a size M GirlyGoGarter®. 1. Put the GirlyGoGarter® on your bare thigh (or over fishnet hosiery). 2. Stretch the garter tight around your thigh and secure it with the Velcro at the back of your leg. 3. Load your necessities in the pockets. X Don't try to wear the GirlyGoGarter® over nylons, pantyhose or pants - it won't stay put unless it's gripping your bare skin. X Don't close the Velcro and then pull the GirlyGoGarter® up your leg like a stocking. It won't stay up unless you stretch the grippers around your thigh AND THEN attach the Velcro tightly. For more information, check out the Instructional Video. Lotions or oils on your skin can reduce the "stickiness" of our patented GentleFlex™ grippers. Simply wipe grippers with a cotton ball soaked in rubbing alcohol to return them to their original grip. GirlyGoGarters® can be hand-washed or put in the washing machine on the delicate cycle. GlitzyGoGarters® must ONLY be hand-washed - never put in the washing machine. Also, NEVER put any of our garters in the dryer, as this will ruin the patented grippers. LollyZip is committed to providing the highest quality products and the best customer service. Each GirlyGoGarter® is constructed with materials hand-picked for comfort, style, and durability. We want you to be 100% thrilled with your purchase. If for any reason you aren't, just contact us within 30 days of your purchase date, and we will gladly refund your money. We will also gladly accept returns or exchanges of unworn, unwashed or defective products for a full refund.